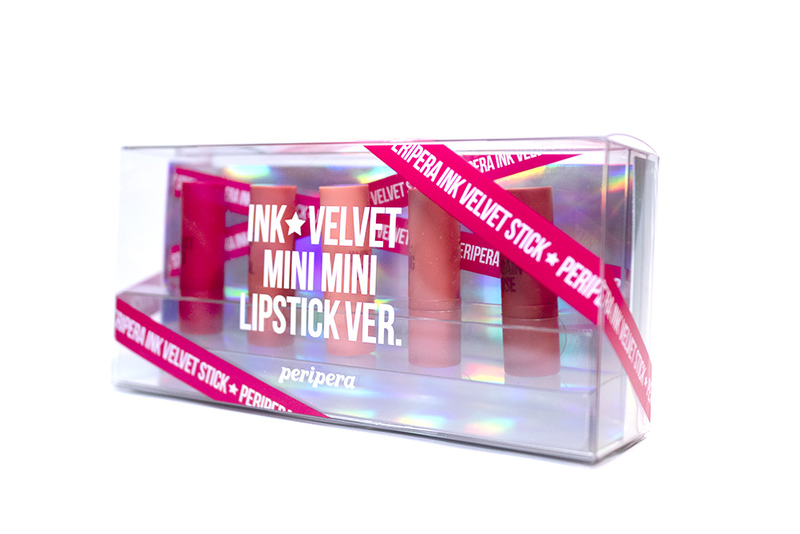 Review: Ink Velvet Mini Mini Lipstick (Peripera) – Oh My Stellar! 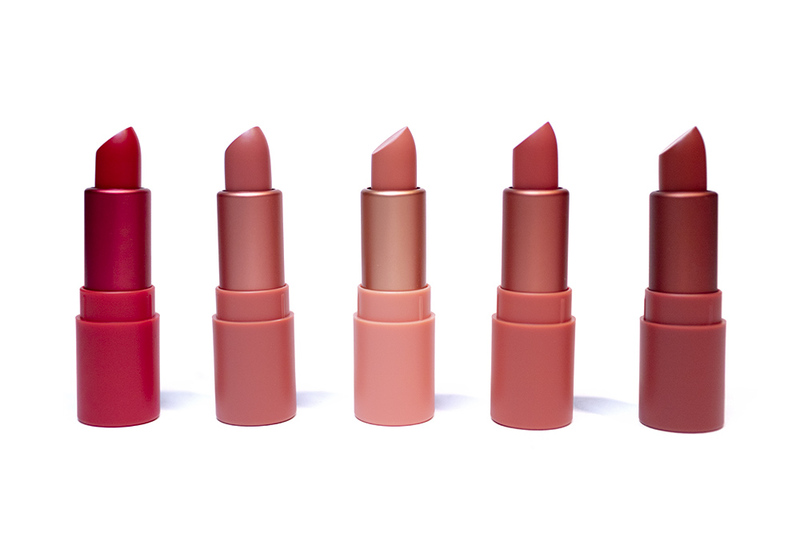 I love trying out new lip products but, truth be told, I don’t think I have ever finished a lipstick in my life – they’ve gone bad, or been accidentally smushed and ruined, but never actually finished. I’ve always felt like I needed to buy a full size of every product but have since realised what a waste it is. I now much prefer to use mini sizes for lipsticks; they’re better to put in your bag anyway and I still get a lot of use out of them. In addition, they’re also a brilliant gift idea because they’re easy to create sets with while still being relatively affordable, so you’ll be sure that there’s shades to suit them. 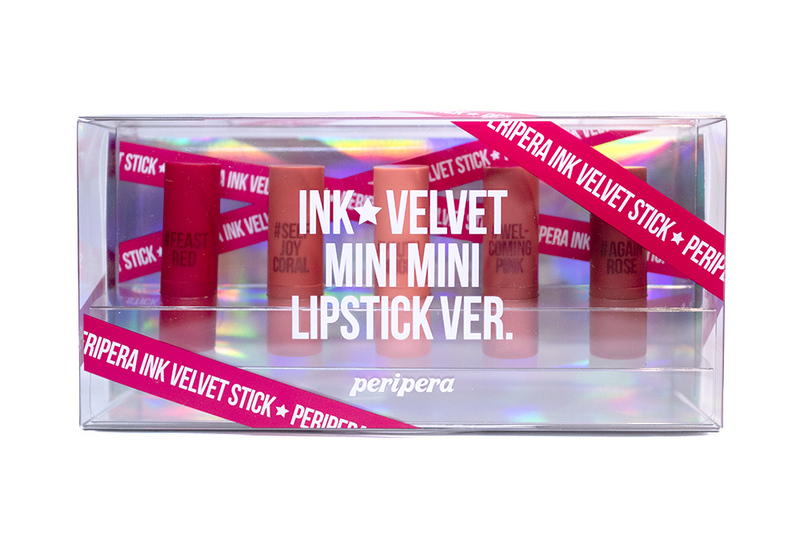 It’s really a perfect idea that Peripera released this set of mini Ink Velvet Lipsticks for the 2018 holiday season and – even though I’m a little bit late with this – it’s okay! 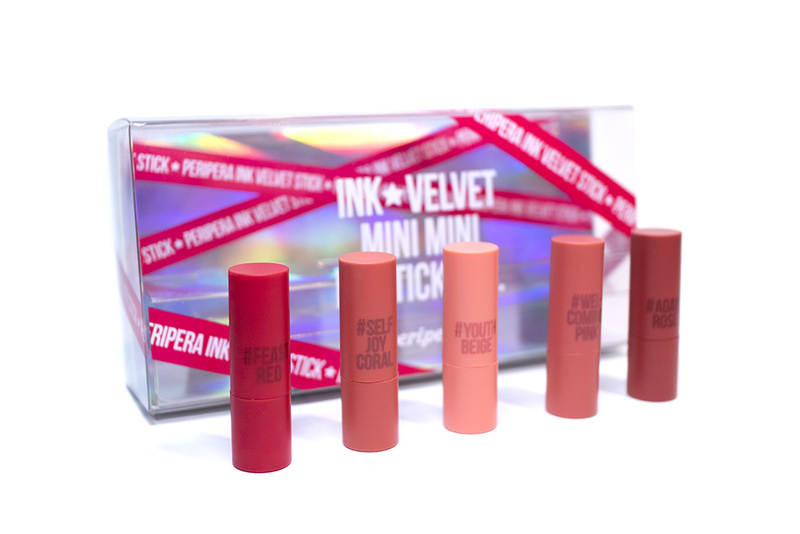 This is the Mini Mini Ink Velvet Stick Set which contains a set of five mini lipsticks in varying shades from neutral corals to a brighter, warm red. I tested these out most days since I received them and have also experimented with carrying them around so I’m pretty prepared for this review! If you want to get your hands on these, they are available on the StyleKorean website for USD$33.60 (full price is USD$42). Otherwise, let’s get on with the review! 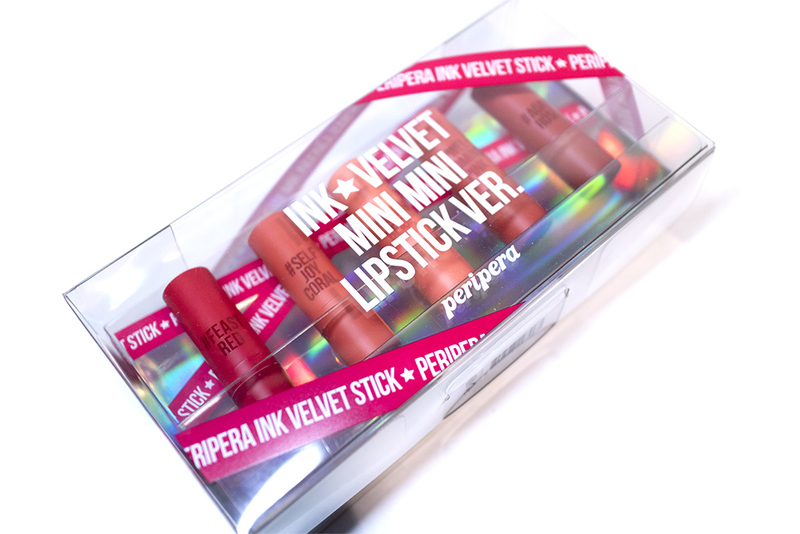 I love this brand and Peripera is especially popular for their lip products, in particular their Peri’s Ink range (which contains around a million shades and multiple finishes from ink stains, to velvety creams and light-as-air mousse formulas). Aside from the massive variety of shades they carry, they are especially well known for having exceptional pigmentation and longevity – especially when it comes to their lip tints. These mini lipsticks are a new formula though; these are touted as Peri’s Ink Velvet in an easy to use stick form. They have a matte bullet lipstick, differing from the already existing Ink Sticks (which typically have a more moisture finish). They claim to have a velvet smooth creamy finish, as well as a bright and intense pigmentation to them. Since they are similar to the Ink Velvet, then you can also expect a matte finish with comfortable wear. In comparison to the inks, these are also even smaller, so they’re very easy to chuck into any bag. This set of five is limited edition for the holiday season, so I think that they might be experimenting with this new formula before bringing out more in the new year. The packaging for this is so ridiculously pretty and it’s obvious that this was released for the holiday. The set comes housed in a clear plastic box, which has the pink ribbon design printed over it to look like a present. The plastic is very thick and sturdy, so it would be safe in any postage as well as being easy to wrap up. 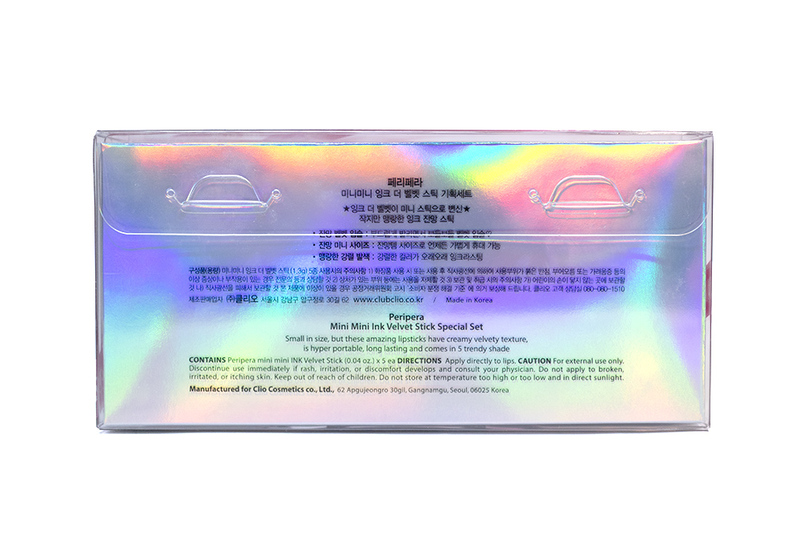 The addition of the holographic cardboard inside so makes the overall presentation look even more beautiful. The packaging of this Mini Ink Velvet Set really is brilliantly presented. I do have a complain though, so let’s move on to the individual lipstick packaging. Being mini lipsticks, these are a lot smaller than a standard bullet size and the entire packaging is only 5.5cm (smaller than even their Peri’s Ink stains), with each bullet containing 1.3g of product. They are all colour coded according to the shade, with the shade name also printed on the side so that you can easily tell them apart. Opening up the bullet, you can see that the interior also have a chrome metallic tube, which is still in the same shade. The monochromatic design of this is very pretty and, if they do bring out full sizes of this, I hope that they will refer to this design. The issue though, is that the cap is not as secure as I would hope. 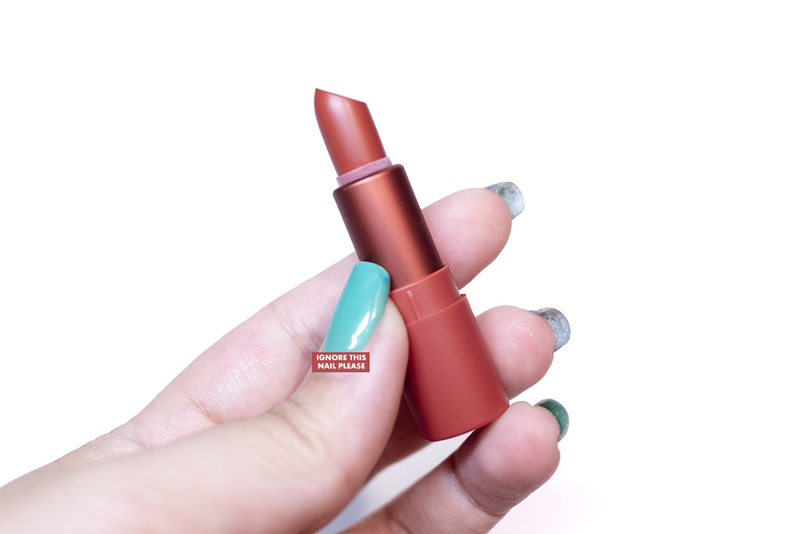 There is nothing for the cap to actually click in place, so I feel like it would come off easily (especially if this is meant to be a ‘travel’ mini lipstick). Personally, I haven’t had issues with that yet but I’m sure that it will happen. As previously mentioned, the lipsticks from this Mini Velvet Lipstick Set all have a comfortable matte finish and a creamy application. It’s lightweight on the lips and easy to blend out, if you want to create a gradient lip. They provide full pigmentation on a single swipe too but the darker colours wear a lot better to me. I feel like the lighter shades have a tendency to emphasise dry patches (though this is quite common). The lipstick wears okay but it doesn’t have the staining or longevity that I’m used to with other Peripera lip products – it will fade away with food or drink. Since it is so small though, and because the formula isn’t too drying on the lips, it is easy to reapply and touch up. My personal favourites would be Feast Red and Again Rose, since I am obviously partial to darker and brighter shades. For daily wear, I also find Self Joy Coral and Welcoming Pink very pretty, but Youth Beige is a little too light for my personal liking. 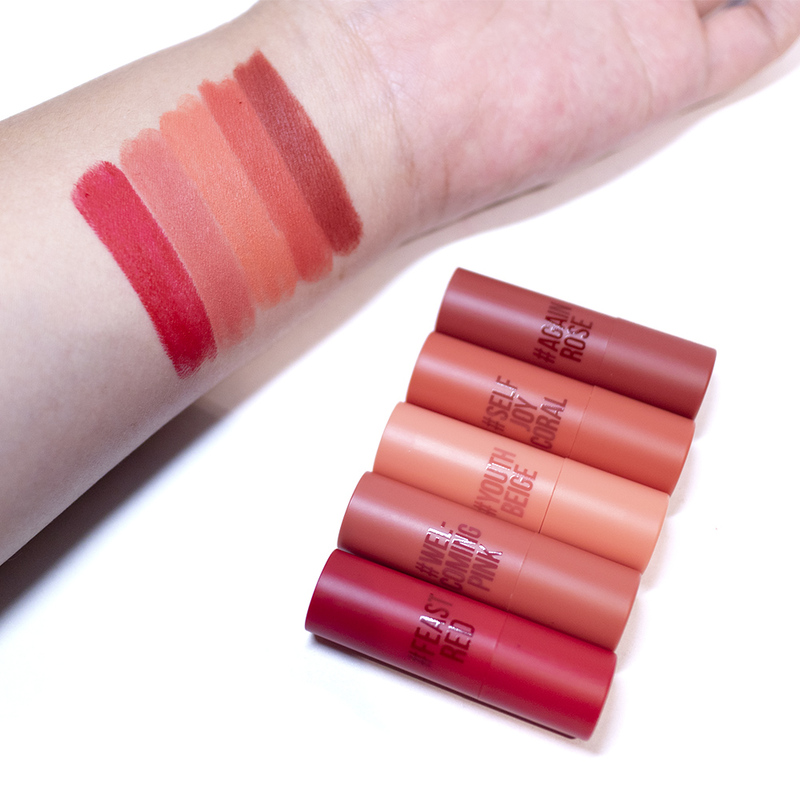 I have the swatches and the lip swatches below. Note how the lighter two shades have a tendency to make lips look a bit drier. 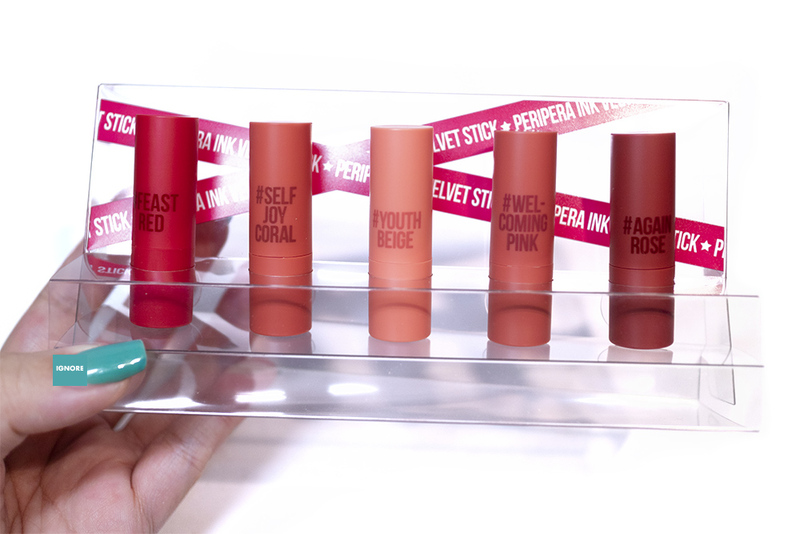 The thing with being lip sets, and this is regardless of what set you buy, is that there are bound to be shades that you prefer over the others. 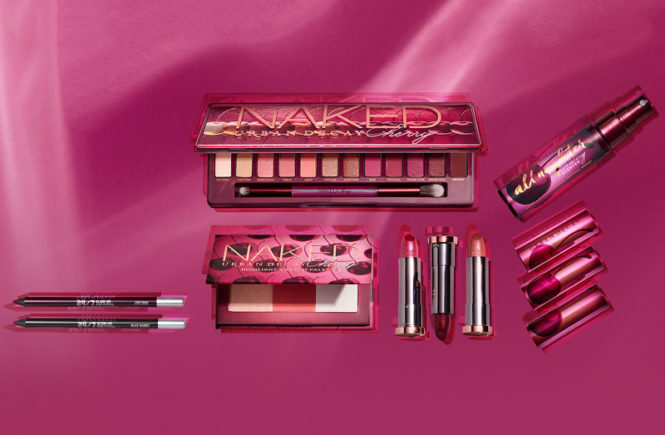 However, the benefit of having the minis (especially for gifting purposes) is that that shade range means that you’ll definitely find something you like in the set – and I personally found 3-4 out of the five suitable for me. The formula is quite mattifying, even if it isn’t too drying, so I would recommend this for people who like matte bullet lipsticks (they would not suit someone with drier lips). I really like keeping them in my make up bag for touch ups during my longer days, though I think that I would be using other lipsticks in the morning. 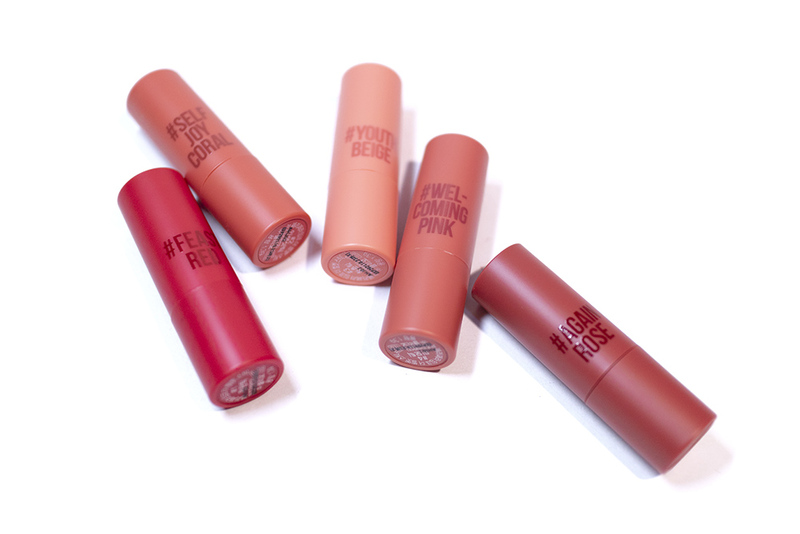 It isn’t my favourite formula, even if I like the packaging and the shade range – I just think that the more hydrating Peri’s Ink Sticks have better application and longevity too (since they also stain the lips). Speaking of the shade range, some of the differences are subtle, especially when they are applied a bit sheered on the lips. However, when you view it as a whole – they can really transform a look. All of these shades fall around the neutral, coral and red spectrum but are generally flattering and also fits well into the kbeauty trends. I love mini lipsticks but, unfortunately, this just isn’t my favourite formula that Peripera has come out with. I have high expectations from them though, so I’m not easy to please. I will continue to use these as I think that they do have some strong points – in the comfortable matte formula, the varied shades and the packaging – but I wouldn’t be rushing to buy this formula again if they release more. These are a good gift idea but, otherwise, I would recommend checking out the Peri’s Ink Stick – which I personally feel is a much superior formula and the price point is actually pretty similar! This set is still available at StyleKorean for USD$33.60 (on sale from the full price of USD$42) – just click here for the product page – but I would also recommend checking out the Peripera Peri’s Ink Stick which sells for USD$12.67 (on sale from USD$15.84).